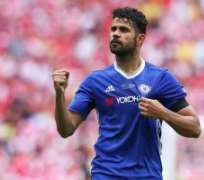 Atletico Madrid are close to agreeing a deal with Chelsea for Diego Costa After weeks of wrangling over the AWOL Blues hitman, his future was thrashed out at a high-level meeting between the clubs yesterday. CHELSEA look set for a busy transfer deadline day – here's how we reckon they could line up after tomorrow. But the Spain star's camp are likely to back down once Chelsea have agreed to his transfer. There is also disagreement over who pays Costa's fine for refusing to return to training with Chelsea, but this is not expected to scupper the deal. Atletico have until midnight on Friday to sign Costa because the Spanish transfer window closes a day later than the UK's. The Blues yesterday made an enquiry about versatile Bayern Munich wing-back Rafinha. Southampton's Cedric Soares is also on their radar. Chelsea also remain confident of landing Leicester's Danny Drinkwater after the England midfielder handed in a transfer request. And they are ready to make an improved offer for Everton's Ross Barkley after having an initial £25m bid rejected.